There were no home comforts for Ampthill Town on Saturday when they lost the lead twice and crashed 5-2 to Hadley while being reduced to 10 men in the second half. In the last of three home games, Town might have gone into the clash with a degree of confidence after beating Hoddesdon previously. But the Potters Bar based side have risen up the table since they beat Town to record their first win in September, and their direct play and urgency proved too much for Ampthill. It was Town’s second home defeat in three outings this month, and they would have expected a better return than three points from nine as they are still languishing near the basement of the SSML Premier Division. Ampthill had to do without the injured Dan Butler who scored two in the previous win, but recent capture Dean Dummett was on hand to put Town ahead in the seventh minute with a sharp finish. But Hadley proved dangerous on the wings, with Meade and Pigden both having chances. 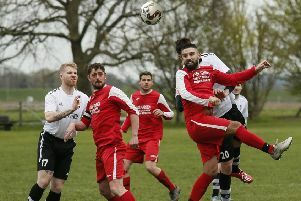 Petrucci also headed over and, despite mounting some good attacks, Hadley were given something of a lifeline when Draycott conceded a poor penalty on the half hour mark and Dom Petrucci levelled for the visitors. Town bounced back, however, and Dean Dummett scored his second when Cullen and Mead set up the chance to put Town ahead at the break. Yet Hadley still had plenty in reserve and, after testing Ambler twice, Dave Pigden levelled in the 65th minute. Ampthill were rocked soon after when Derwayne Stupple was dismissed for a bad tackle and Hadley took full advantage. Jernade Meade put them ahead when he drove home after a quick counter from a Town free-kick, and two goals in the last 10 minutes from Bombaxe and Machado completed another bad day at the office for Town. Hadley had more will to win and were very positive up front, while Stupple’s dismissal left Town with much to do after forward Carl Ramsay retired early from the clash with a groin injury. Ampthill now face two away games against St Margaretsbury and Kings Langley, before a crucial home match with fellow strugglers Holmer Green.